I’m going to have to level with you guys. I am really not a morning person. During the weekends, I’m more than likely to be fast asleep until lunchtime. Getting up pre-dawn is akin to torture for me, necessitating an intricate series of alarm clocks and thermonuclear devices in order to get my lazy tush out of my cozy bed. But for the first official National Final of the year, scheduled to start at 4:15am Central Standard Time (or a perfectly reasonable 11:15am in Kiev), desperate times called for desperate measures. If the Australian fans have to get up at the arse-crack of dawn to watch Melodifestivalen, I could brew a pot of coffee, force my eyes open, and tune in to a Ukrainian National Final. Twenty acts went head-to-head on Saturday in Kiev, with many eyes on JESC-alum Viktoria Petrik’s “Love is Lord” and neAngely’s Swedish-written “Courageous“. 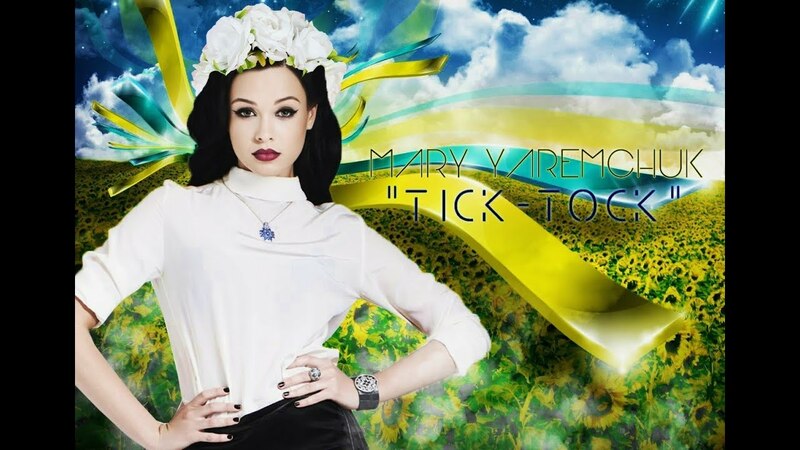 But after the jury had its say, and the SMS votes poured in, it was Maria Yaremchuk‘s sassy, self-penned “Tick Tock” that stole the show. She received 3,478 votes from the public, more than the next three contestants combined, and also took top marks from the jury. Twenty-year-old Maria, the daughter of popular singer Nazariy Yaremchuk (who passed away in 1995), is no stranger to international competition. She represented Ukraine at the New Wave Festival in Jūrmala, Latvia in 2012, coming in third place. One of the benefits of a country choosing their entry so early is that they have months to refine, revise, and rearrange the song as needed. Over the past few years, Ukraine has made a trend of sending highly-polished presentations (generally with powerhouse female voices) to the international stage, utilizing every tool at their disposal to make their three minutes as memorable as possible. Hell machines, shirtless silver gladiators, sand artists, and the tallest man in America have all figured into recent performances…with four and a half months to mold “Tick Tock”, will we see Ukraine hit their seventh Top Ten placement in twelve years? This is only the first song out of approximately 36, so it’s probably too soon to tell. Could I have slept in and watched the replay of the show on demand when I woke up? Sure, I could have. But there is something about witnessing the first check mark being inscribed on the roster that kept me awake. Although I was too tired (and, in all honesty, incoherent) to actively tweet, it still gives me the warm-fuzzies to feel like part of the global ESC community, all of us watching the sun rise over a new year. What do you think of the first entry of the year? Leave a comment, and get the conversation going! Posted on December 23, '13, in 2014, Ukraine. Bookmark the permalink. 5 Comments. Like our psyches at 3/4:15 in the morning, that national final was in shambles! Mediocre performances, an overabundance of great interval acts, and a lackluster winner did not make me a happy person at 5 a.m. I will say that the delirium induced by the event and its preparation did make everything seem really funny and tolerable, from the show to Twitter and elsewhere. Part of me wishes that more national finals would happen like that but then I remember how unbelievably easy our schedule is and “nope” right back to sanity. As for “Tick-Tock,” I had a terrible feeling it would win right after performing, which made me sad. The song’s intro was quite nice but the second she belted out “we belong to each other like a sister to a brother,” I cackled and checked out. Add on the pointless chorus and mind numbing repetition of the whole thing and you have a strong contender for a bottom five entry on my list. And to think they could’ve chosen Victoria Petryk, Tetyana Shryko, Illaria, or Anatoly Shparov. I can’t see her doing a Zlata and saving this thing. 😦 Crash and burn in the semi, please! You are completely right, that the interval acts outshone the acts themselves…but when you have Zlata Ognevich in a room with just about anyone, that’s par for the course, don’t you think? Yes, Zlata is quite radiant. It’d be hard to upstage her. My picks would’ve been Anatoly or Tetyana, whose song (in studio) is the first real gem of the season we’ve heard live, for me at least. And though she was weak, it almost worked, especially in the verses. Speaking of gems, “Hunter of Stars” in Switzerland is close, and “Pēdējā vēstule” and “Bučas” in Latvia will get official status as soon as we hear the live performances. Things are off to a pretty okay start, no? Much better than the Belorussian bedlam that rung in 2013. It took eurovision.tv around 36 hours to successfully get it posted, well after the entire broadcast had showed up on YouTube. And the version posted (on both) is the original Ukrainian telecast, not the streamed one with the English language announcer. In short, I WISH I had gotten up to watch it live when the alarm went off, but nooooooo … I was tiiiiiiired … and I figured I could watch the replay when I woke up. Of course I was also recovering from chickenpox, so I have a pretty good excuse. Those Ukrainians have shown time and time again that they know how to play the game. This entry will need the time to revamp, and even then, it will probably not be my ultimate favourite. At least these people care, and it will surely show in their final result. NeAngely was in the Ukrainian national Final, too, in 2007, if I remember correctly. It was where I first heard of them. I just thought they would have had something more in store for us than typical Swedish fanfare.